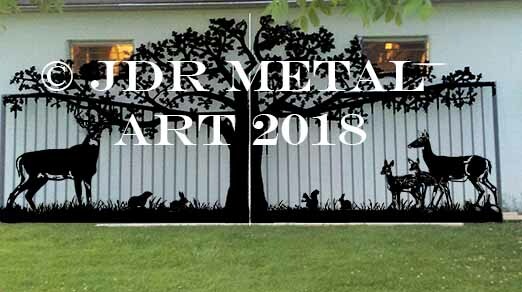 deer silhouette gates Archives - Custom Driveway Gates - Iron Steel & Aluminum - JDR Metal Art - FREE Standard Shipping! 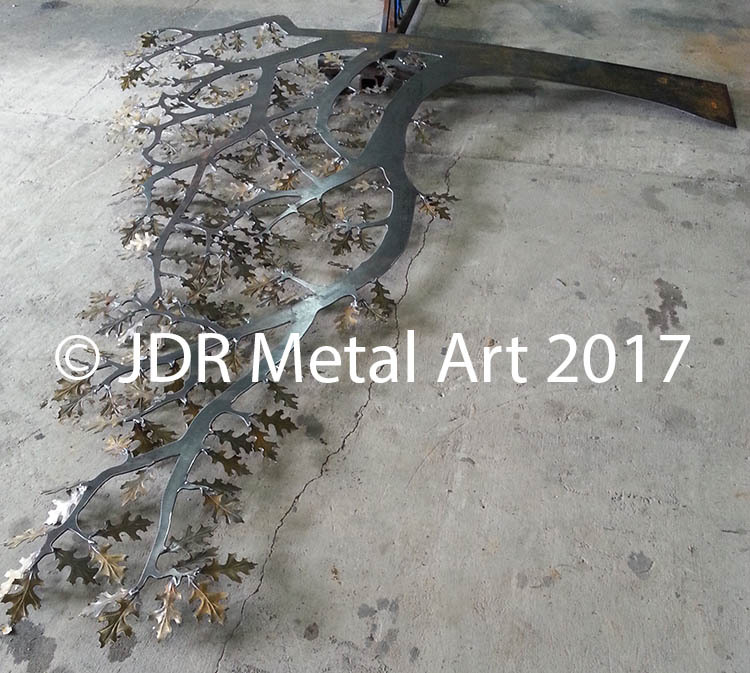 Building unique driveway gates is something we love to do at JDR Metal Art. 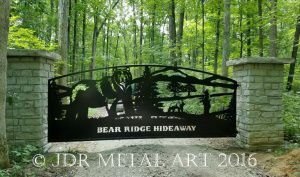 We recently finished a 16′ single swing gate and a 18′ double swing gate for clients with an impressive piece of land in the southern Indiana hills. 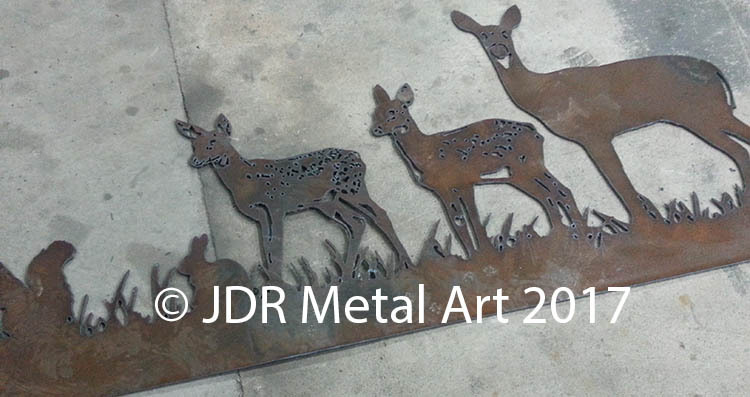 These Cincinnati Ohio driveway gates were built and installed by JDR Metal Art. 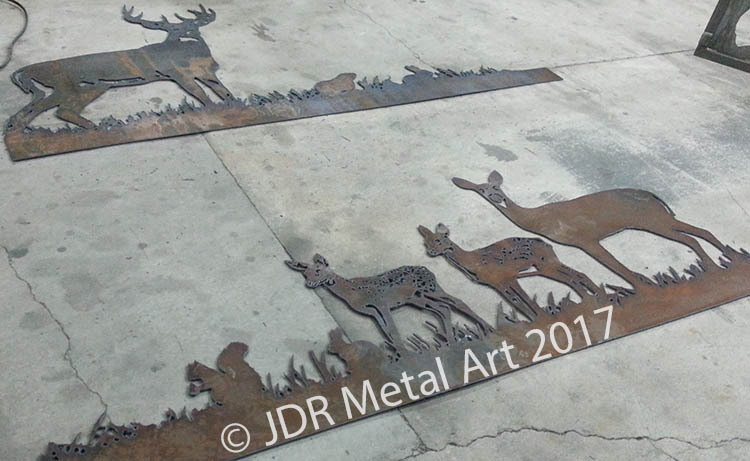 They are 16′ wide and feature two whitetail deer and a fox in a woodland setting. 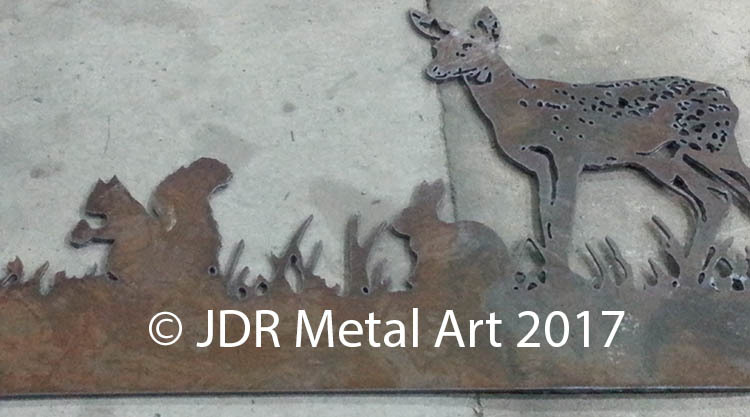 It was custom designed, drawn out and plasma cut by hand. 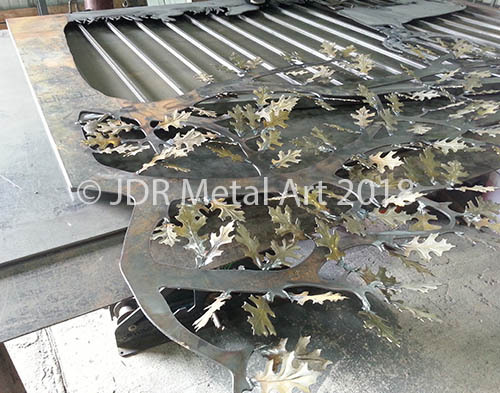 Each gate panel is plasma cut from 11ga. 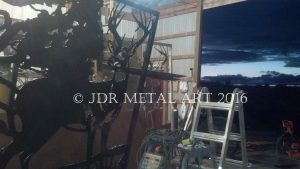 cold rolled steel and framed with steel 2″ square tubing that has walls 1/8″ thick. 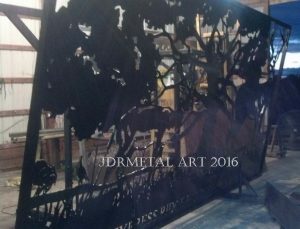 They weigh approximately 250 lbs per panel.They were painted black with urethane paint. 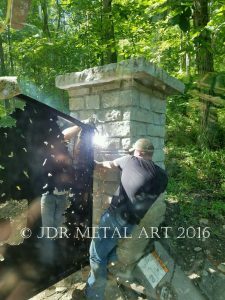 We used steel 4″ square tubing with 1/4″ wall thickness for the posts and then filled them with concrete and rebar for added stability. 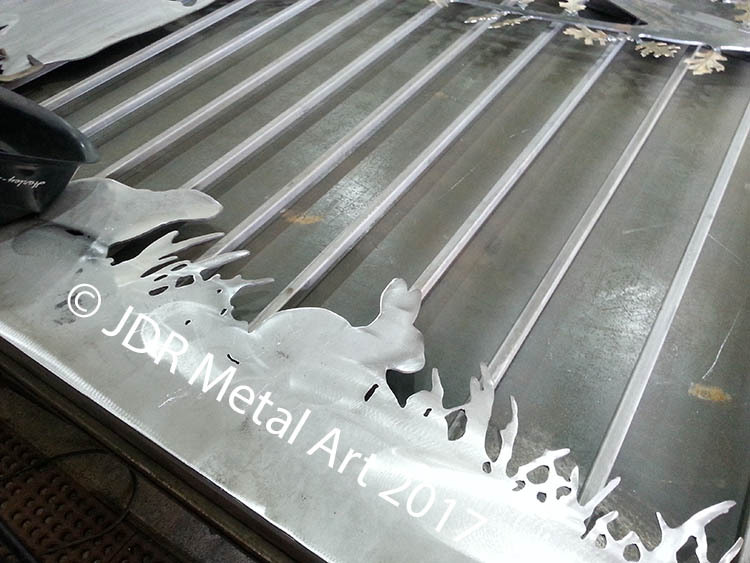 The hinges are steel blocks with J-bolts and stainless steel ball bearings. 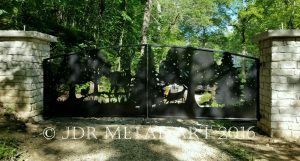 We installed automatic gate openers and automated exit devices with these gates. 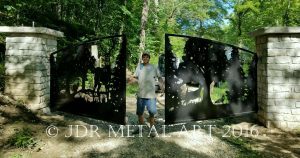 Custom Gates at Affordable Prices! 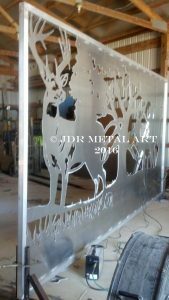 We can customize this design to fit any size entrance. 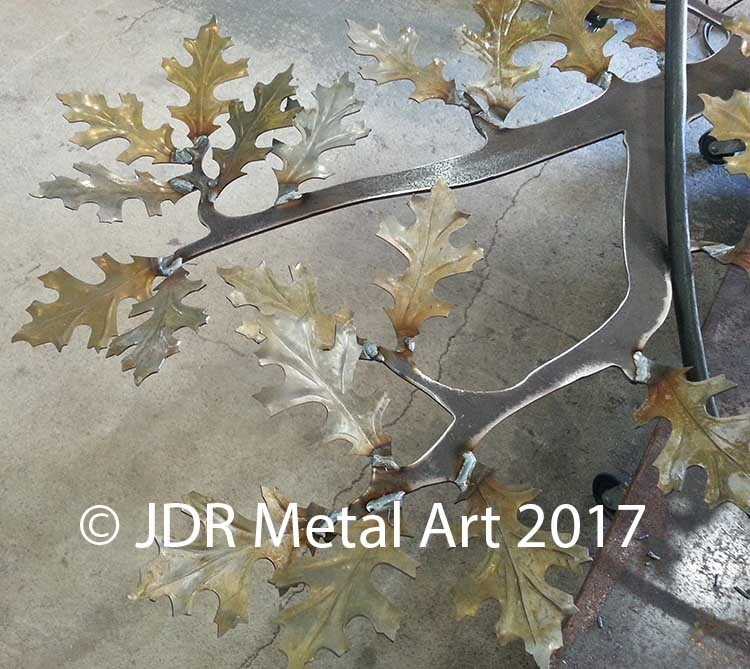 Some of our design themes include horses, wildlife, and iron oak trees. 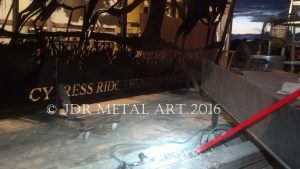 We can also add custom lettering such as farm or ranch name, family or business name, etc. 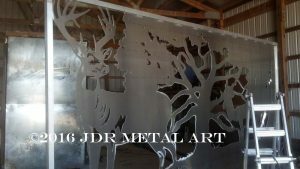 Or we also offer new custom gate designs from scratch! 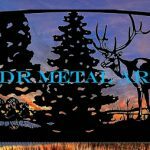 It doesn’t matter whether you are local to the Cincinnati, Ohio area or from any other part of the country; we regularly ship our gates all over the US at the lowest rates available and also offer local pickup and delivery options in Ohio and the Midwest. 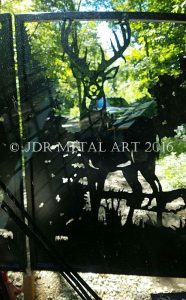 Worldwide Shipping Also Available-Contact Us Now for a quote! 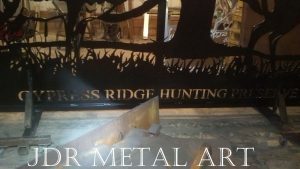 We serve not only Cincinnati and the rest of Ohio but regularly ship our rustic entry gates nationwide using freight companies such as FedEx, UPS and many others. We use a variety of freight brokers so that we can pass the most competitive shipping prices along to our gate clients. 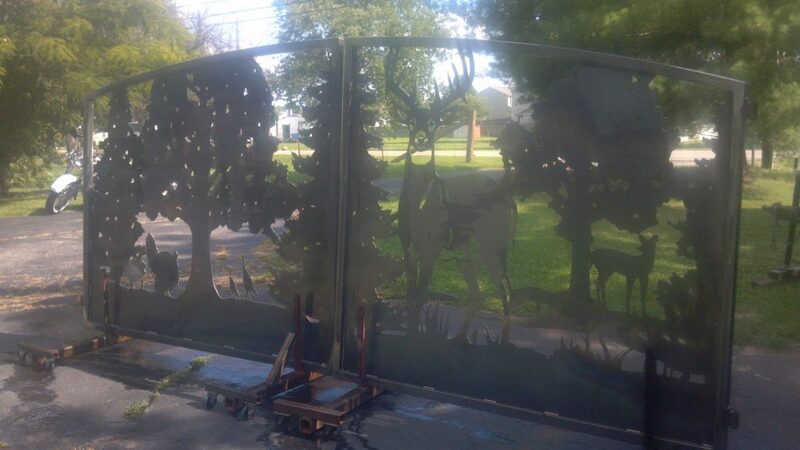 All gates are powder coated and extremely durable. 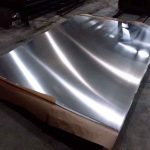 They are then carefully wrapped in shipping foam and then multi-layered in corrugated shipping material and shrink wrapped before being crated and shipped from our local freight terminal. 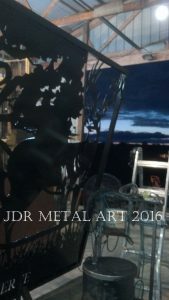 You can pick it up from your local freight terminal or have it delivered directly to your home and business. 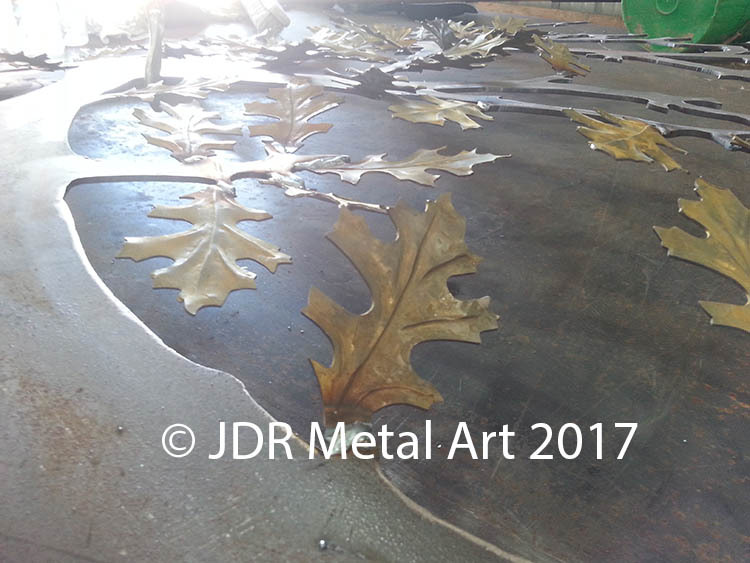 Contact us for a free shipping quote to anywhere in the world.